I remember watching a video of the commencement speech given by Steve Jobs at Stanford and his mention of connecting the dots as you go through life. This really hit home for me as I was in the trenches of my own startup. I’m someone who used to struggle with the phrase “It’s all about the journey”. Yeah, yeah, I’d think “forget the journey, show me the destination”. Then I did a startup. While you’re working on something day and night and literally all consumed by making your idea a reality — to the point where you’re an absolute bore at social gatherings because you have one topic and one topic only — you feel as if you’ve taken huge leaps as each month rolls by, and in some cases you have. But when you get to the proverbial ‘destination”, you look back on the early days and realize that the journey was way different than you expected or planned. This is what they mean by ‘the journey’. It’s a puzzle being put together one piece at a time and you don’t get the full picture until you’ve finished (ahem, when you’re dead). You can’t rush the journey and if you try (and I have, believe me) you will experience far more headaches and hardships than you would normally on the already grueling startup path. I believe that life is a lot like this. You can try and micromanage your life by planning out each step to get to whatever destination you’re aiming for — whether it’s to be a successful entrepreneur, a doctor, married with kids, a famous actor — but in the end, it will happen as it’s meant to. So save yourself the hassle. Aren’t you tired? I am. I believe you simply put out in the world the things you need help with and then pay attention to the things that come into your life. 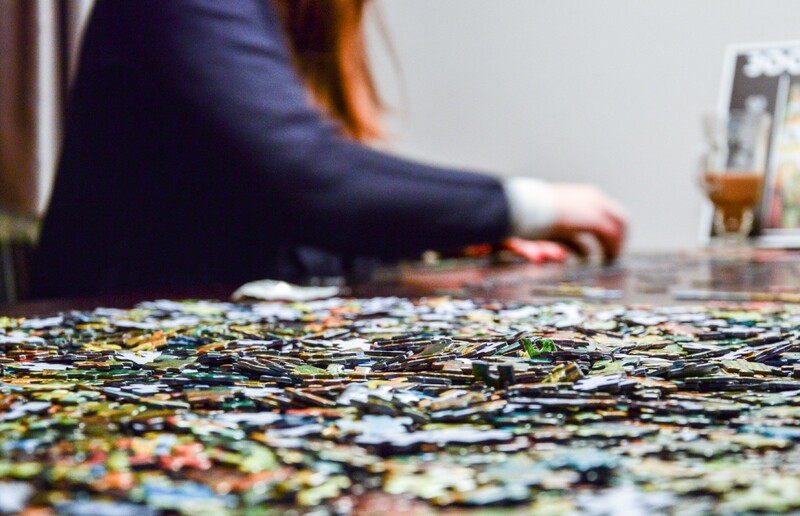 Think of each encounter, article you’ve read, or event you’ve attended as a puzzle piece being surfaced. Your job is to simply receive it, study it and then find the place where it fits. Of course, not all moments are meant to be puzzle pieces, that’s where the observing comes into play. It’s similar to what Elizabeth Gilbert writes about in her book “Big Magic”… about ideas floating around until they find someone willing to bring it to life. The universe is pretty persistent if there‘s something that you should pay attention to. This happened to me with regards to the startup I’m now working on. It was an idea germinating for over a year and after pushing it aside multiple times, it came back to me through another person. I remember at that meeting my skin was vibrating because it was as if someone was literally speaking the words I already knew because they were inside of me. We go through life moving from one place to another, meeting all sorts of people, and generally bumping into things. In my experience things are way easier when you sit back, enjoy the ride and honestly just get out of your own way. This doesn’t mean you should kick back on the couch with a bag of chips and wait for something magical, but you should live with intention. That’s your job — to pay attention and recognize the synchronicity of events happening in your life. Then watch things unfold and see what is presented to you each day. Oh, and when you get a puzzle piece, give it a home. Don’t waste it.